We love pasta in this house. It’s one of my absolute favorite foods and I especially love a good cream pasta! I pretty much never make cream based pasta sauces because we try to make healthy choices when cooking at home. 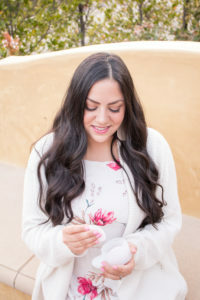 I’ve been experimenting with making healthier cream sauces and while neither Bassam or I are vegan, we don’t mind trying out vegan recipes as they are typically healthier. We eat way too much cheese and it’s always great when we can make something delicious without cheese. 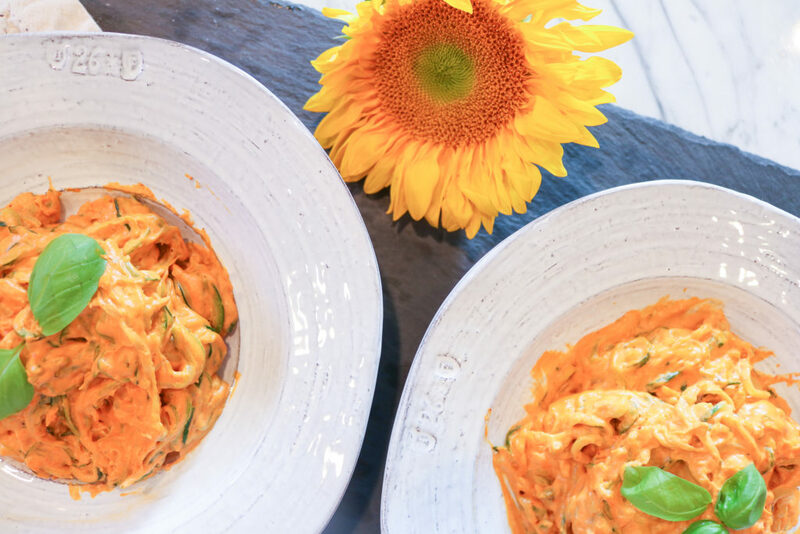 This creamy roasted red pepper sauce pasta is absolutely delicious and comes together with very little effort. Bassam actually got into it after I finished blending up the sauce and started eating it with his fingers; that’s how much he liked it! Next time I’ll probably make more of the sauce to keep in the fridge for the next few days. It’ll be great as a sandwich spread, topped over eggs, and much more. 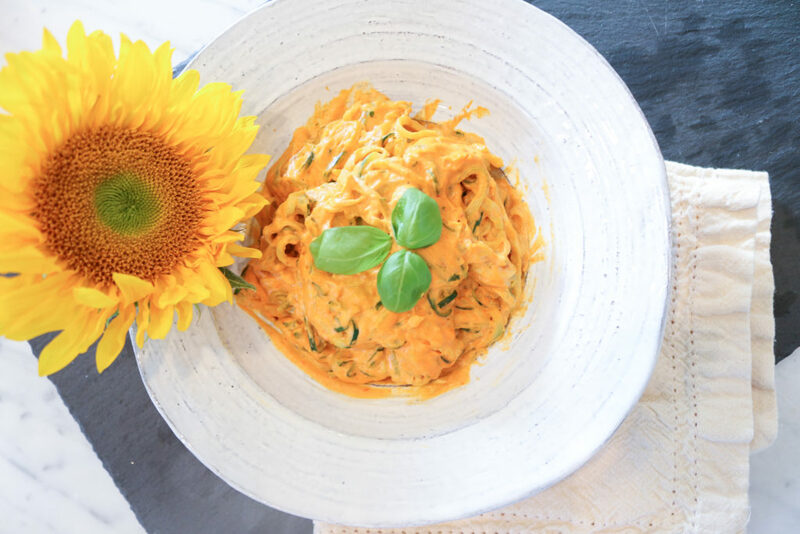 This creamy roasted red pepper sauce pasta is the perfect meal for a quick weeknight dinner or if you’re having anyone vegan or dairy-free over for dinner. 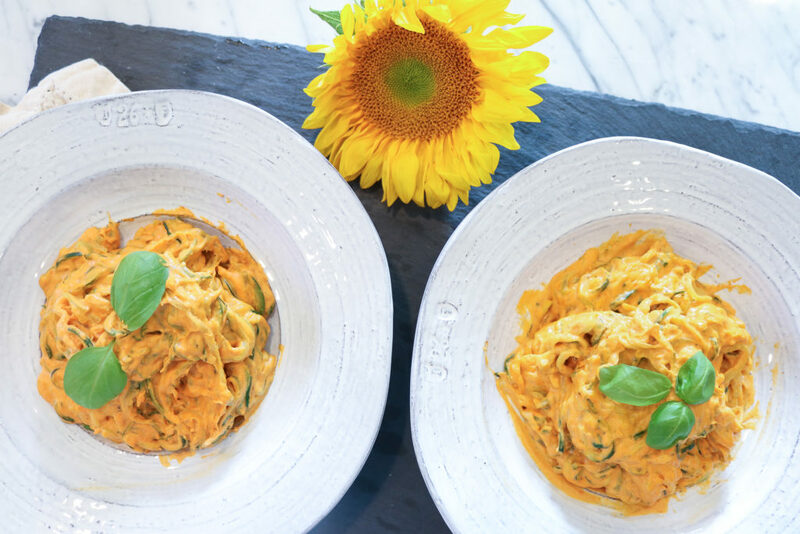 We used spiralized zucchini to keep it extra healthy, but you can make it with any kind of pasta you like. 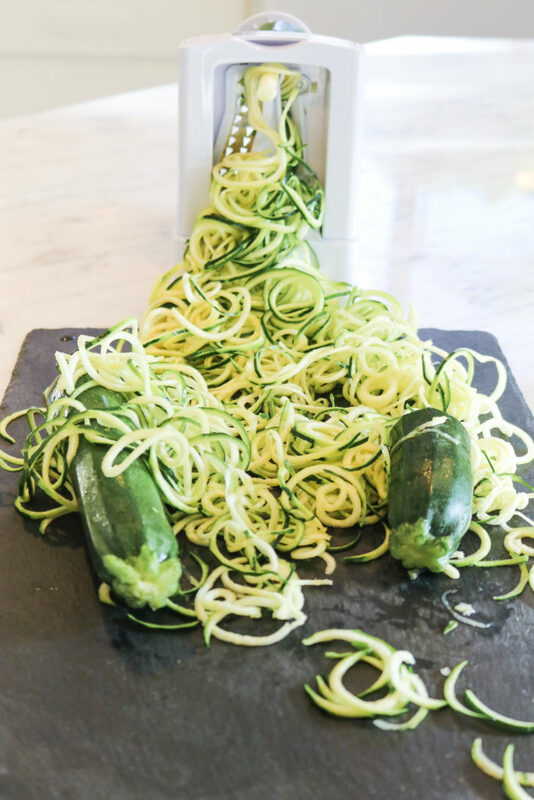 If you don’t own a spiralizer, we highly recommend this one. The dish comes together with under 10 ingredients and I really feel like the roasted red bell pepper makes the flavors sing. It’s creamy, velvety, savory, just the slightest bit spicy, just the slightest bit sweet, and so satisfying. Eating healthy and dairy-free never tasted so good! 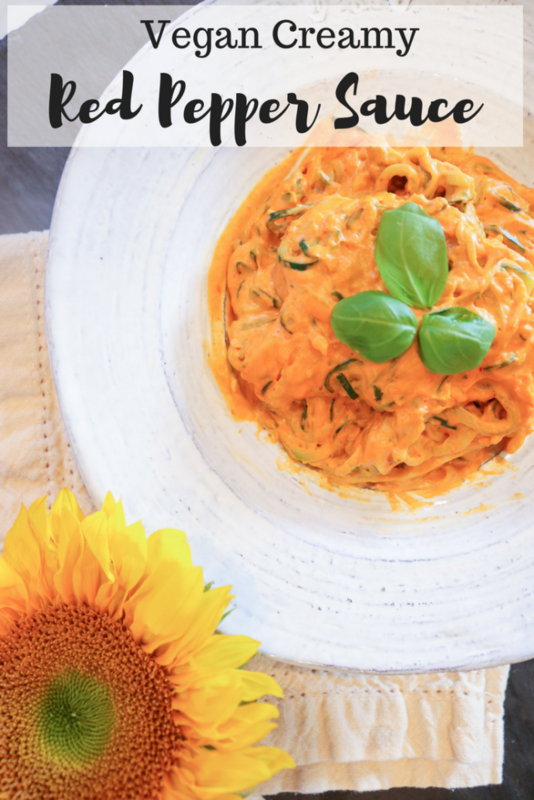 A delicious, easy, and healthy creamy roasted red pepper cream sauce. Perfect for a quick weeknight dinner and also feeding anyone who is vegan or dairy free. Simple, healthy, yet incredibly satisfying. Cut red bell peppers in half. Cut out the stems and clean out the seeds. 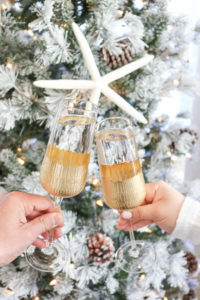 Lay on a baking sheet covered with foil or parchment paper. Drizzle with olive oil and some salt. Roast 20 minutes each side. While the bell peppers are roasting, cook your pasta or spiralize zucchini. We used spiralized zucchini, but you can use zucchini or whatever pasta you like. When the bell peppers are done roasting, blend them with all the other ingredients (coconut milk, garlic, soaked cashews, salt, and red pepper flakes). If using spiralized zucchini, saute the zucchini in a large pot for a few minutes. You can add oil if you'd like, we do it without any. Add the sauce and stir for just a few minutes. You can add a bit of water if it's too thick for you, but we like this consistency. Serve immediately. Garnish with basil if desired. What can we use instead of coconut milk and cashews? 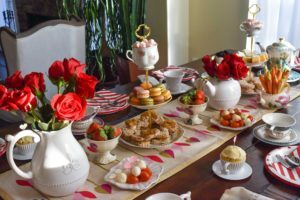 (allergic to both) will cooking cream work? And how can we make it lighter if we use cooking cream? Honestly, I’m not sure! I use coconut milk in place of cream which helps keep it light and dairy free. You could potentially try using regular milk and see if it works? 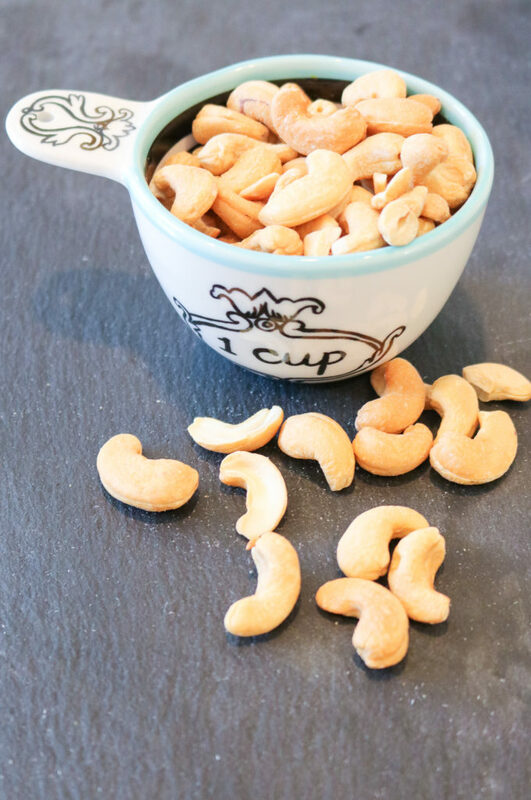 The cashews also help make it creamier, but if you’re using cream or milk you wouldn’t need it. You could try omitting it and see how it works? 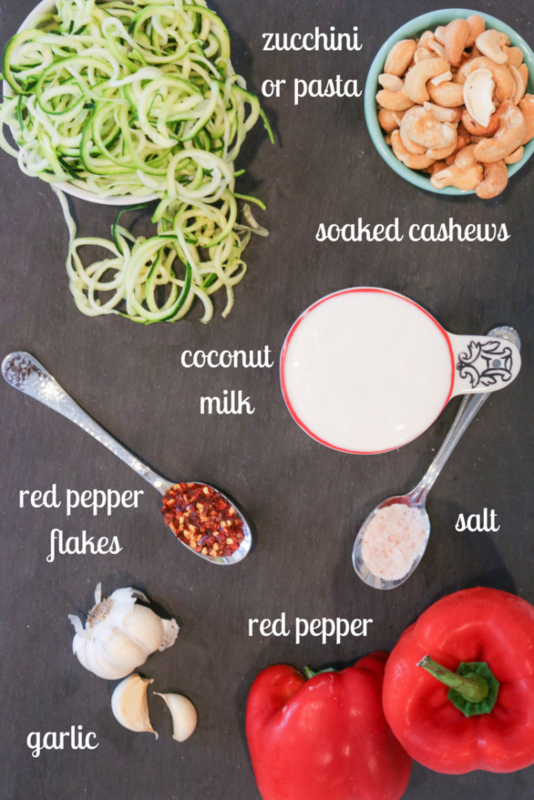 I use cashews and coconut milk a lot when I’m trying to make creamy foods lighter and I’m so sorry because I’m not sure what you could use instead!